What started out as an idea at the Trail Works meeting in March has turned into an inspirational butterfly trail dedicated to Leigh Ann Henry a few months later. It is appropriate that on the eve of Thanksgiving I thank everyone who has made this trail possible. This is more than a stone dust trail through the woods. The Forever Wild for Everyone trail in Lyons needed to be built from scratch.The day Carol May and I mapped out the trail, we had the trail go through a dirt pile. In fact this dirt pile was the former High School football field that was home to two championships. It was also in March that I ran into Rich Henry and his daughter Leigh Ann at a musical. Leigh Ann was in a car accident two years ago and is now in a wheelchair. At our next Trail Works meeting not only did Leigh Ann become a board member, we dedicated the trail to her and the many that will follow after. 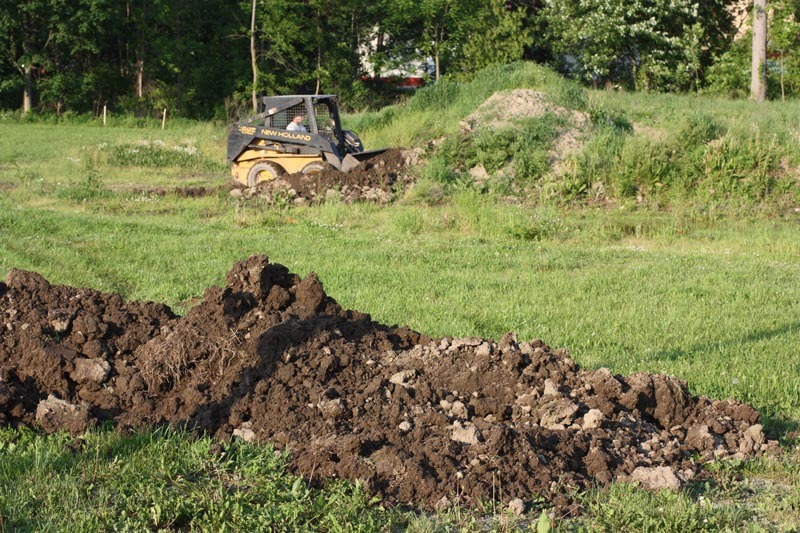 Now the task at hand was how do we turn a dirt pile into an inspirational garden? It all starts with an amazing design. The design was compiled by landscape designer Diane Young. She gave us the blueprint, then it was up to us to implement. We couldn't get started until the middle of June because of the wet spring. We spent that first weekend with three bobcats moving soil to build the three main berms. (By building the berms we are able to hide things like the bus garage to the east and bring a natural feel to the trail more quickly.) 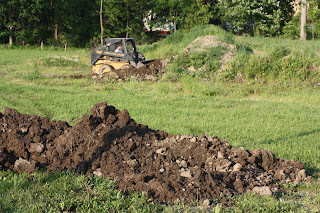 It took us until the end of June to get most of the dirt moved.Then it was time to plant and plant we did with the children from the Lyons Community Center in association with the Creating Healthy Places Eat with the Cornell Cooperative Extension. It was a true pleasure to see how excited the kids were to plant and get their hands dirty. They planted trees, flowers, and vegetables. Why was planting so important for the children? For many, this was the first time they have ever done this. I remember one day we were planting herbs and I had the kids smell the herbs and tell me what it was. One of the boys turned to me and said, “It’s was a dill pickle?” I said, “Where’s the Pickle?” By the end of the summer not only did the children know the names of most of the flowers and plants, they also knew how they were used. As soon as we finished planting at the beginning of July the weather turned hot and dry. We were all taking turns watering the flowers, plants and trees. Work on the trail stalled during the summer because of the heat and other factors. If we ever needed a spark it was at the end of July. I had called Santo Monanato and asked him if he could donate some river rock for the drainage we designed. I will never forget that July day as I was driving into the parking lot. Not only did two large piles of rocks greet me; I was also greeted with two different butterflies. Perhaps this cliché has been over used but in this case it was true. I had told the children “If we plant the right flowers the butterflies will come.” If we were ever in need of a spark this was it. It’s amazing how something so small can give you so much hope. If this was the spark then the lightning bolt came in early September, when Larry Graf of Art Graf Inc. showed up with a bulldozer to finish grading the trail. I must backtrack to put this story in context, while buying an ice cream in May; I talked to Larry about the Forever Wild for Everyone Trail at the Lyons Community Center. While I waited for my double dip cone Larry said, “He would help out.” Larry never forgot and showed up in early September to finish the trail. He donated a bulldozer and an operator for a day. A couple days later when I got the bill in the mail,at the bottom of the bill there was a big 0. From that day on we have been on a mission to get has much done as possible before winter comes.It seemed like things started coming together in October and November, not only has the weather been amazing the donations have been as well. All of a sudden materials and equipment to complete the trail started showing up.When I stopped over to Phelps Cement and asked about a possible discount on paver for the beginning of the trail, Iwas soon driving home with a load of donated pavers. I called Paul Stoep and then the gravel came. We needed away to move the gravel and I called Brian Secor and Butch’s Handyman Service and they donated the use of a bobcat.We scheduled a planting day over Columbus Day weekend when we planted garlic, trees and perennials to fill some of the berms. Ages from four to eighty participated in the planting. One thing I have noticed is that gardening has no age limits. When we planted the garlic we planted it in the shape of a heart, while we were planting we came up with the idea to call the Children’s Garden, “Garden of Love.” We have been blessed with some amazing weather this fall and we have taken full advantage of this great weather to put down gravel, and stone dust on half of the trail.Over the Thanksgiving weekend we started working on a covered bridge to connect the east and west sides on the trail. Last weekend while we were working on the covered bridge, Rich Henry brought his daughter Leigh Ann down to see the trail. 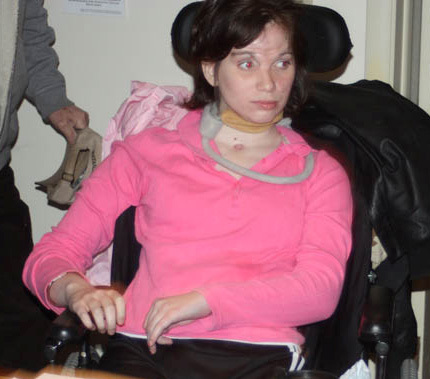 It was the first time for Leigh Ann to go down the first 150 feet of the trail in her wheelchair. As Leigh Ann was coming down the trail in her wheelchair, she gave us thumbs up. At that minute I knew all of our hard work was well worth it. I will never forget that smile and that thumbs up.Future plans for the trail are to finish the trail through the woods making everything native in the woods, building a long house, and a Children’s Garden. Plans are now underway for a dedication to take place in the Middle of May. It is amazing the good things that come about on a project when you are surrounded with people who care and show compassion for a project. It becomes infectious. To date, 350 hours volunteer hours and $9, 375 in-kind and material donations have gone into creating this trail. Located in Lyons, this trail is will provide a path into nature for many years to come. A place of peace and beauty where we can all become one with nature. As one of boys said to me this fall about the Dawn Redwood he planted, "Someday when I come back this tree be over a hundred feet high as he looked up as he grasped the needles. Yes, he will come back along with many others that will also come . They will come to see the flowers, the wildflowers in the woods, butterflies, birds and trees that will reach for the heavens. I would like to quote from Aldo Leopold who said “We abuse land because we regard it as a commodity belonging to us. When we see land as a community to which we belong, we may begin to use it with love and respect”. * I think Aldo Leopold is looking down from heaven today and smiling. *Evan Dawson's story was shown on News 13 and you can see him “on the beat” at the trail while filming the story in the top right photo. to Black Brook to a native example of Western NY flora. The ecological benefits of this reclamation along the prolific Black Brook are another small part of the benefits that AES created and manages for the landfill at the Seneca Meadows Wetlands Preserve which also intersects with Black Brook. “The educational as well as ecologically beneficial components of this small area of removing invasive species and re-planting native species will have long-term positive effects for the local environment.” said Andy Buss of AES.